"Owning a boat on Vancouver Island, seafood IS dinner 4 to 5 times a week. 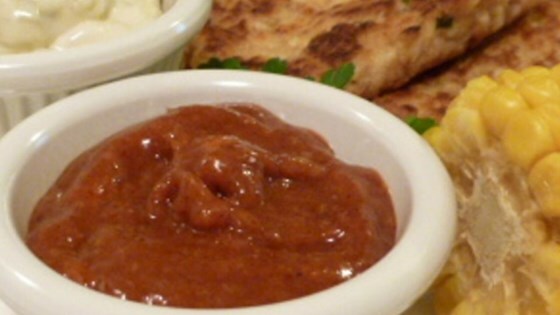 This great sauce goes with oysters, halibut, cod, shrimp and wild Pacific salmon. I hope you like it too!" Stir together ketchup, horseradish, garlic, chili powder, and allspice in a small bowl. Cover bowl; refrigerate for at least 4 hours before serving. This was a very good cocktail sauce. It uses ingredients one is likely to have on hand, and it was just what we needed for our shrimp. It is unlikely I will purchase bottled sauce again. I made this just as the recipe said. Was wonderful...better than the store bought! super easy to make, and has a good flavour. I will make this again. Simple and delicious. A great sauce for oysters, shrimp and prawns. Sharp and tangy.... Livens the fish up.